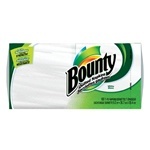 Bounty Paper Towels are the quickest, most absorbent household roll towels on the planet. Buy your wholesale Bounty Paper Towels from the restaurant supply superstore. Don't rely on cheaper brands that don't absorb nearly the amount of liquid bounty does. Wholesale Bounty Paper Towels for your restaurant kitchen.